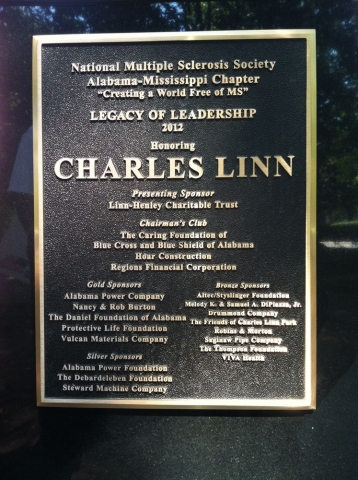 Charles Linn was one of Birmingham’s original civic leaders and a visionary of commerce. A native of Finland, he worked as a sailor and ship’s captain before embarking on a remarkable career in business. 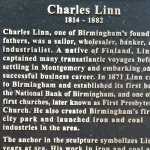 Linncame to Birmingham in 1871, the year of the city’sfounding. 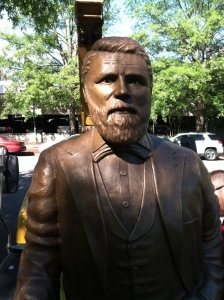 He was a pioneer of the area’s iron and coal industry and he founded the National Bank of Birmingham, which later became Regions Financial Corporation. 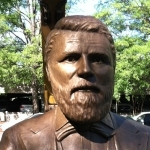 At his own expense he created the city’s first park, known as Linn Park. The anchor in the sculpture symbolizes Linn’s years at sea. His efforts in iron and coal are represented by a pouring crucible and coal car. 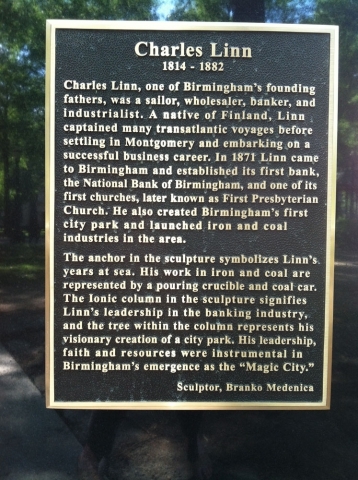 The Ionic column in the sculpture signifies Linn’s leadership in the banking industry, and the tree within the column representshisdevotionto the creation of a city park. 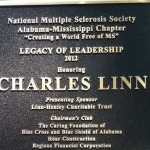 Always an optimist about the city’s future, Linn was a man of vision, energy, and determination. The legacy of his character and leadership remains strong and visible.